The BRIO allows instant heel height changes while maintaining optimal alignment. Pyramid receiver attaches to any foot with a proximal male pyramid. reducing stress on residual limb. Adjusts up to 1¼ in., 26cm foot. Answer 2TM footwear, now available through SPS, has been expanded to include more styles to provide a multitude of choices when aligning a patients daily activities with functional needs and aesthetic preferences. With simplified part numbers and standardized sizing, Answer 2 footwear now can be accurately measured on any non-branded Brannock and non-branded Ritz Stick measuring device. New Answer 2 shoes may be ordered in half pairs, mismatched sizes, or as a custom shoe to meet all your fitting needs. Becker Distributes SpineCor in U.S.
Becker Orthopedic is set for the United States distribution of SpineCor®, a dynamic system that utilizes postural re-education to target four key progression factors of idiopathic scoliosis: neuro-musculo-skeletal dysfunction; growth asymmetry; postural disorganization; and spinal deformation. Clinically proven to be 89 percent effective in a 400-patient, ten-year study. Documented Cobb angle reductions maintained for five years after treatment. Custom made to measurement from Becker Central Fabrication. Dedicated U.S. technical/clinical support staff. In an effort to make the introduction to Ossurs Rheo Knee® and Proprio Foot® as convenient as possible, SPS is offering on-site training on these products. Molly Cooper, CPO, SPS director of clinical and technical services, will visit your facility and provide training for you and your staff. The hands-on session will provide working knowledge of how to properly select, specify, and utilize all the functions of either the Rheo Knee or Proprio Foot. Order either product through an SPS sales manager and request on-site instruction. Plaster casts or splinting a pediatric leg or foot is difficult for the patient, parent, and practitioner. Therefore, SPS is pleased to announce the immediate availability of Bebax® and Clubax®, the innovative orthoses for the convenient and effective treatment of leg and foot deformities. The multi-directional hinge of Bebax is quickly and easily adjusted for abduction, adduction, pronation, supination, and external or internal translation. 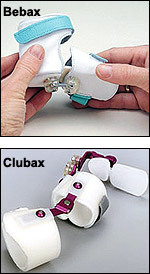 The multi-directional hinge of Clubax provides movement in vertical, horizontal, or oblique planes. Various sizes are available in both models. SPS announces the opening of a new, 30,000-sq. ft. distribution center in Middleton, Pennsylvania. SPS fourth facility will ensure the ability to deliver products to customers in the Northeast promptly and efficiently, often within one business day. service locations in Florida, Georgia, and California. ALPS GP (general purpose) Gel Liner, in stock at all four SPS distribution centers, provides the perfect combination of strength, durability, and value with a solid warranty. The GP Liner features the softness, strength, and elasticity of the ALPS EasyGel Liner with comfort and durability at a price that will make you smile. The GP Liner's unique attributes include a new distal end encapsulation, which retrofits most liners on the market and includes a minimum one-year warranty. Both locking and cushion versions are available 3mm/6mm uniform configurations. 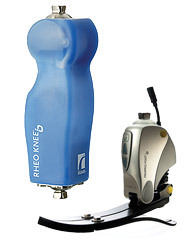 The new OMEGA® Tracer® version 10 software focuses extensively on orthotic applications when using the OMEGA Scanner. The new orthotic capabilities enable practitioners to broaden patient services for increased patient care and profitability. Detailed insoles, cranials, knee braces, and custom breast prostheses may be created by capturing shapes using the OMEGA Scanner, modifying shapes via OMEGA Tracer software tools, and fabricating at our OMEGA Fab facility or a partner facility such as ContourMed. 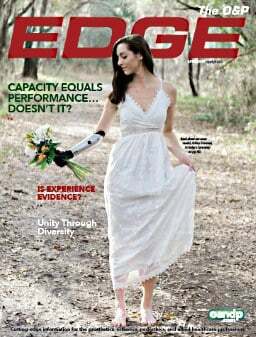 Omega Tracer continues to make the creation of prosthetic and orthotic devices easy, affordable, and profitable in one system. cervical spine motion. Now, when necessary, that control can be extended with a new Thoracic Extension option. 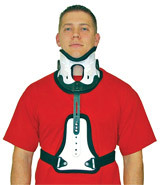 The extension is intended for low cervical/high thoracic immobilization. It is available in one height-adjustable size and easily snaps onto the Pacific Adjustable Collar. The extension can be purchased separately or as a fully assembled CTO. Juzo® Soft 2000 Stockings are now available from PEL Supply. Juzo designed these new stockings to be so soft and inconspicuous, wearers will forget they have on a compression stocking. Knitted with unique FiberSoftTM weave. 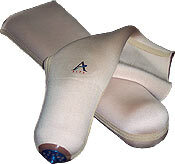 Extremely soft and elastic for comfort, easy movement. Open or closed toe, in knee-high, thigh-high, and pantyhose. Compression 20-30 or 30-40mm Hg. Beaded silicone border on thigh-high and knee-high. Available in white, black, mink, or beige. Composite or plastic? Get the best of both worlds with TFC, Fillauers new versatile ThermoFormable Composite material. TFC combines the localized strength of carbon composite with the modeling properties of plastic. Unilateral and bilateral carbon fibers are interwoven with a revolutionary thermoplastic fiber that allows the material to be formed at lower temperatures. This thermoplastic material also acts as a high-strength matrix for active performance and flexibility. TFC is custom formed to your mold with a heat gun and is also fully heat re-moldable. Visit ISPO Booth 200 to see live TFC demonstrations and receive more information. The SocketConeTM, a quickly cast and fabricated socket available through Chesapeake Medical Products Inc., can be modified and fitted in an hour. Made from a low-temperature (160 degrees F) thermoplastic reinforced with Kevlar, the SocketCone requires only one patient visit and never needs plaster. The SocketCone makes an excellent IPOP and can be used as a temporary prosthesis, a dynamic test socket, as a shower/swim leg, or as a spare prosthesis. Cost effective and perfect for use in developing countries, the SocketCone can be reheated and remolded as many times as needed. Had Enough of Nylon Hose? If you use nylon hose for vacuum forming or laminations, youll love FeatherStretch nylon from Rx Textiles. This strong, lightweight material stretches way more than nylon hose. It comes on a convenient 25-yd. roll for easy use and has a sheer knit that creates an excellent finish on thermoplastics and laminated sockets. The regular size (2¼-in. wide, fits 26-in. circumference) should fit any below-knee application, and the wide size (3¼-in. wide, fits 56-in. circumference) stretches to fit the biggest above-knee applications. 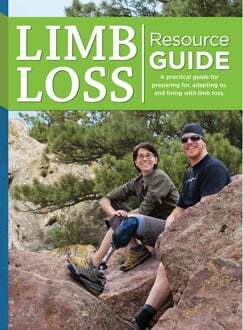 Available through Cascade Orthopedic Supply, PEL, and SPS. The 1322A polycentric knee joint "from ST & G Inc." with pneumatic swing control is best suited for use with a low to constant walking speed, and it provides a higher degree of safety. All axes of this knee have been built-in bearings that allow for ultra-smooth walking movement. The frame construction is made of super-light aluminum alloy and the four-bar linkages are made of aircraft alloy (AA7075). The product is tested to ISO10328, 125kg. The knee has a two-year warranty. Call a Knit-Rite representative for more details and pricing. This 18-in. vinyl doll helps children develop social-acceptance and understanding from others. Having an amputee doll named "Sew *ABLE*" changes the focus of amputees to a very positive way of thinking and helps enable them to better share insight and understanding of their differences with family, friends, and teachers. Typical comments include: "Thank you. These dolls mean a lot to the children!" 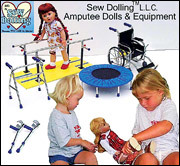 Nine of the specialized "Sew *ABLE*" Dolls have above-knee and below-knee prosthetic legs. It is suggested that the dolls and accessories be used by children ages eight and up. Engineered Silicone Products (ESP), Newton, New Jersey, introduces its new self-adhesive silicone, which is easy to use and can be applied anywhere a smooth surface or light padding is needed. Peel the paper backing from the silicone and place in the area desired for simple and quick application. Trim the self-adhesive silicone to the desired shape for an unlimited number of uses. The clear, self-adhesive silicone is super thin (.51mm) and easily conforms to irregular shapes. Call today or visit ESP's website.